**** Chosen by Winner: Kevin D.
The Bomb Ordnance is a custom Les Adams automatic knife with a state of the art A.O.S. locking features. This Always On Safety automatically locks the blade in the open and closed position with a quick release side lever. The blade remains in a safely locked position until you release the lever and press the firing button. A high torque spring rapidly fires the blade into open position. Les makes his own Carbon Fiber using a 12-ton press and using the highest quality epoxy resin. A bead blasted right-hand titanium pocket clip is provided. 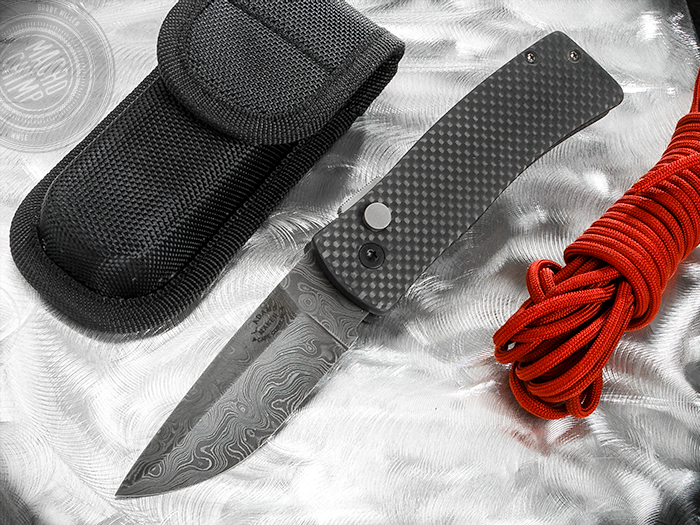 The 3.375-inch blade is random pattern carbon Damascus. At only 3.5 ounces, this is one of the lightest autos you'll find.